You’d think that given the absolute gong show that Mike Kelly has been running since he took over the Bombers, he would be glad when other teams do things that take the media’s attention away from him. Apparently that is not the case though. With the signing of alleged gun toting yahoo Jason Armstead, the media had turned their attention to the Riders. This apparently didn’t sit well with Kelly so he went out and signed a higher profile, more controversial kick returner… Pacman Jones! How do you like them apples Tillman?! Pet Peeve: When strippers assume they get to keep the $80,000 you shower them with. So based on the information above let’s predict how Pacman will fare with his new team. - His wrestling experience clearly indicates that he’s a team player… one of championship caliber to boot. - His tendency for spitting on and assaulting women… well that can’t be a good sign but I guess 2 out of 3 ain’t bad. While many are questioning the logic in this move, I’m gonna go ahead and assume it has something to do with their current kick returner being James Johnson and therefore they were in need of a massive upgrade (that’s right I cleverly turned a Pacman Jones story into a James Johnson burn). With the Bombers coming to town, I would recommend that any news reporter looking for a good story camp out outside of Dancers (or inside, but only if you’re very very brave). Though I wonder if Jones will truly grasp how far his career has fallen when he’s beating up a stripper from one of the lowest forms of gentlemen’s clubs around for taking his roll of loonies? "Making it Rain" with loonies is much less fun than with dollar bills... not that I would know or anything. And because one legitimately crazy person is never enough, Winnipeg also picked up Charles Rogers. That's the last city in Canada that needs more degenerates. Yeah Winnipeg is officially a gong show. They tried signing Pacman, until they realized they couldn't get him across the border. 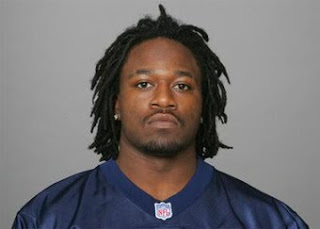 They tried signing Rogers, until they realized he was suspended by the NFL and thus not eligible to play in the CFL. I'm convinced that Winnipeg had planned on having Michael Vick as thier starting QB until Philly ruined their plans. i was really hoping he would come and play in the labour day game. i had a little fantasy that goes a little like this . . . back for his first punt return of his CFL career, Pacman calls for a fair catch, catches it, stands there, and then is BROKEN IN HALF! being that he isn't the smartest of fellers, this may have actually happened no?